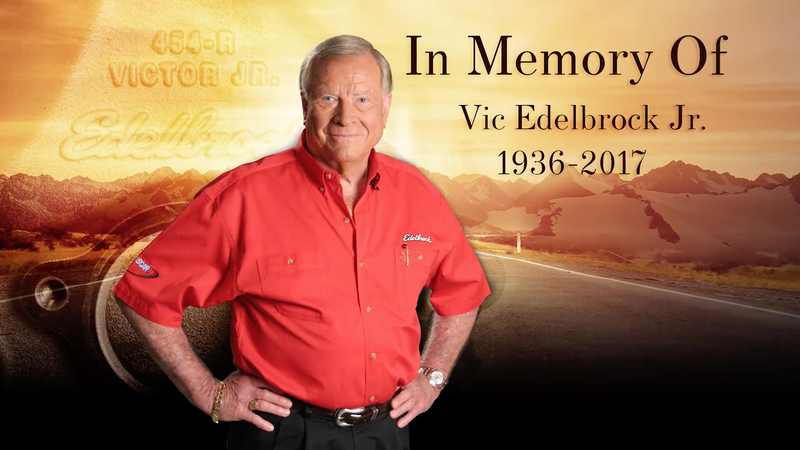 VIDEO: A Touching Tribute to Vic Edelbrock Jr.
Last week, when we first heard about the passing of automotive performance industry legend, Vic Edelbrock, Jr., we thought it was a cruel Internet rumor. So filled with life, ingenuity and a deep passion for [red] cars, it seemed as though our friend Vic would live forever and thought that the “rumor” couldn’t possibly be true. Unfortunately, it was, and his passing has rocked the industry. Having taken over the business after his father’s passing in 1962, Vic Edelbrock Jr. took the solid platform that he had helped his father build to heights that would have seemed unbelievable just a few decades ago. Whether it was a Flathead Ford, Small-Block Chevrolet or even today’s LS, LT, Coyote or Hemi engines, the Edelbrock’s mindset was that no challenge was too tall or a risk too large. Much like his father, he believed that there was potential everywhere. He also believed in manufacturing all of your products here, in the Good Ole’ USA! If you were to look under the hood of just about any high-performance street machine on the road today, chances are very high that you’ll find Edelbrock hardware under them. Everything from carburetors and camshafts, to supercharger kits and suspension components have bore the Edelbrock name. Just as this tribute video put together by our colleagues over at RTM suggest, he was clearly an innovator, a racer, a builder, a patriot, an entrepreneur and a hot-rodder who based his life believing that “Faith, Family, Commitment and Determination help each of us live the dream.” We wish Mr Edelbrock Godspeed, and send our condolences to the Entire Edelbrock family. VIDEO: The Camaro ZL1 1LE Slays the Nurburgring!